The sailors were wounded on Marshall Islands-flagged White Shark vessel when it was 154 nautical miles away from Nha Trang city. The victims have suffered multiple injuries in different areas of the bodies. Especially, one of the sailors named Ritche Magbanua, born in 1973, suffered severe injuries. 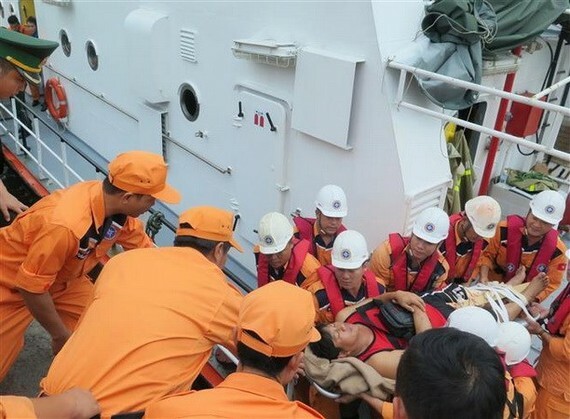 The ship’s captain sent an urgent request to transfer the injured crew members to hospital in Nha Trang for medical treatment. Upon receiving the request, the MRCC of Region 4 contacted the ship directly to provide first aid guidance for the wounded. However, as the victims’ condition worsened, the centre sent vessel SAR27-01 from Nha Trang port to promptly carry them to the city. Since September 2018, the MRCC of Region 4 has rescued eight sailors aboard four foreign vessels who were injured while travelling through the international shipping line.